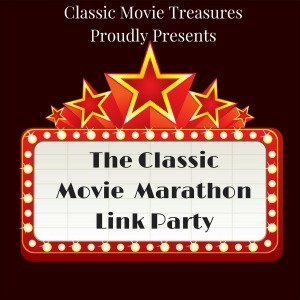 I'm co-hosting this week's Classic Movie Marathon Link Party with Elaine of Classic Movie Treasures and Paddy from Caftan Woman. Feel free to jump in and share your articles and links about everything and anything classic-movie related. Welcome to The Classic Movie Marathon Link Party #16! Thanks you for joining us and sharing your love of classic movie. Link Parties are very popular in the food and lifestyle niches just like blogathons are popular in the movie niche. This link party is the only one going on in the movie niche so a lot of movie bloggers aren't even aware of what a link party is, so we are going to leave the description below as part of the post for all the "new to link parties" bloggers. If you are not a blogger and just a classic movie lover like us, you will discover the vast array of classic movie bloggers around the world. We have contributors from Finland, Brazil, Canada and the UK! Amanda chose Classic Movie Treasures profile on Norma Shearer.